Listener Question: How has 3d changed in the past 60 years? Just who will play Superman? StarWars as never seen before. 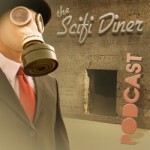 SciFi Five in Five: Jay from Atlanta covers the top five classic horror films. Question: What commonality does Michael Shenks’ characters on SG1 & Smallville have? You will have until November 2nd to answer this question. Send your answer with your mailing address to scifidinerpodcast@gmail.com, call us at 18885084343, or DM us on Twitter at @scifidiner. GRAHAM HANCOCK is the author of the major international bestsellers The Sign and The Seal, Fingerprints of the Gods, and Heaven’s Mirror.His books have sold more than five million copies worldwide and have been translated into 27 languages. His public lectures, radio and TV appearances, including two major TV series for Channel 4 in the UK and The Learning Channel in the US – Quest For The Lost Civilisation and Flooded Kingdoms of the Ice Age – have put his ideas before audiences of tens of millions. He has become recognised as an unconventional thinker who raises controversial questions about humanity’s past. In the early 1980’s Hancock’s writing began to move consistently in the direction of books. His first book (Journey Through Pakistan, with photographers Mohamed Amin and Duncan Willetts) was published in 1981. It was followed by Under Ethiopian Skies (1983), Ethiopia: The Challenge of Hunger (1984), and AIDS: The Deadly Epidemic (1986). In 1987 Hancock began work on his widely-acclaimed critique of foreign aid, Lords of Poverty, which was published in 1989. African Ark (with photographers Angela Fisher and Carol Beckwith) was published in 1990. While researching Supernatural Hancock travelled to the Amazon to drink visionary brew Ayahuasca – the Vine of Souls – used by shamans for more than 4000 years. It was his experiences with the vine lead to his latest work, Entangled. Written with the same page-turning appeal that has made his non-fiction so popular Entangled is his first novel. It tells the story of a supernatural battle of good against evil fought out across the dimension of time on the human plane. On this, the 161st anniversary of Edgar Allan Poe’s death, we decided to remember the hallowed author by listening to performers such as James Earl Jones, Christopher Walken and William Shatner read us his most haunting poem. Now that Michael Bay’s third Transformers film finally got itself a title two weeks back—Transformers: The Dark of the Moon—all it needed was a plot. And one just leaked online, thanks to a board book meant for kids. We may not have learned much new, but hey—at least now it’s official! Transformers: The Dark of the Moon will hit theaters July 1, 2011. Brandon Routh Back in the Running for Superman Role? Ever since the announcement that Zack Snyder would be the director of the Superman franchise reboot, it’s been the general consensus that Brandon Routh would not be reprising his role as the Man of Steel. However, in light of a growing internet campaign to push for Routh in the new movie; it now appears that the actor may indeed have another shot. In a recent article by the News Of The World newspaper, Snyder revealed that Routh would be considered for the role. “I didn’t realise there was such a groundswell,” Snyder was quoted as saying after learning of the internet campaign for Routh. Morgan Freeman has been trying to get an adaptation of Arthur C. Clarke’s first-contact classic Rendezvous With Rama made for almost 20 years—with David Fincher on board to direct—and the Oscar-winner says he’s closer than ever. While doing press for his upcoming action-comedy Red, Freeman let slip that he’s still very much committed to getting his longtime passion project—in which a massive spacecraft, dubbed the Rama, enters the solar system—off the ground. So George Lucas wants to make 3-D versions of all six Star Wars films. Good idea? Bad idea? We won’t know until 2012. But meanwhile, a talented musician and animator has made his own version of Star Wars that gets as far away from 3-D as possible. Jeremy Messsersmith wrote a song about Star Wars and created an accompanying music video animated with paper versions of all the familiar characters. Dollhouse Season 2 came out yesterday. I may or may not have charmed Mike into loaning me some money so I could buy it. See, a limited number of DVDs came with a comic. And I? Was going to get that comic, no matter how many babies I had to slay or how many Mikes I had to use my womanly wiles on. The day before release, I even visited our FYE and got one of the guys there to hide a copy for me. There was a lot of uncertainty revolving the comic: Did you only get it with preorder? Was it digital or hardcopy? Where exactly in the story does it pick up? Because of my problem dedication, I can answer these questions for you. The comic is only guaranteed with preorders, and only a certain number of DVDs have it. It is hardcopy, and fits right inside of the DVD case. It’s a little guy. It seems to me that it picks up between Echo and friends’ stories and Maggie, Zone, and company’s stories — right at the beginning of all of the chaos. This panel gave me chills. the comic book treatment of Joss Whedon’s “Dollhouse” would continue. “This is something that Joss had gone back and forth on at different times,” [Atkins] said. “It started with us doing a small story to be inserted in the ‘Dollhouse’ season 2 DVD that got the ball rolling, and we will do a one-shot in April and a miniseries after that.” The comic will be written by Jed Whedon and Maurissa Tancharoen, the writers of the TV show, and will be set in a future Los Angeles after the Dollhouse technology has reduced the city to ruins. I can’t wait for more. “Epitaphs” left my heart pounding and reignited my passion for the series. (Luckily, I now have it all on DVD.) I can’t wait to see what’s coming up. The art was gorgeous and colorful, which did not take away from the drama and darkness of the story at all. The dialogue, of course, was awesome. The story was both familiar and new, since we learn exactly how Maggie and Zone end up in this whole mess, as well as a few other stragglers. We still don’t know how they end up in the same group, but maybe that will be explained in the one-shot. Really, this little comic was a tease, but also a promise of more to come, and as a fan who loved the TV show, I can’t thank Joss, Jed, Mo, and the team at Dark Horse enough. Have you read this little teaser? What did you think of it? Will you be counting down the days until April? You want to hear more about the Enterprise taking you into space in your own lifetime, you say? Well, we’ll point you in the right direction. It seems our favorite real-life VSS Enterprise from Virgin Galactic, will be starring in its own four part documentary called “Virgin Galactic” beginning Monday October 18th on the National Geographic channel at 10pm ET/PT. The new documentary series will star Richard Branson and Burt Rutan, and will take us along for the ride as they bring us Huu-mons closer to everyday space travel…and thereby, one step closer to the Federation. Be sure to check it out and see all the amazing science, imagination, and courage that have made this project come so far. For more information about the show, check out the National Geographic channel’s site here. Hey guys I thought I would give you my top 5 classic Universal Monster/Horror Movies, since it is close to Halloween. I have fond memories of watching these as a kid after going trick or treating. These movies are true classics in movie history. Some of these movies used ground breaking special effects, costumes, and makeup for their time. Everyone should see them at least once.